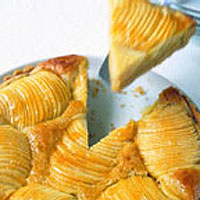 In this stunning almond tart, thinly sliced apple halves rise up through golden frangipane. Any eating apple is suitable here but raspberry-scented Discovery or strawberry-scented Worcester Pearmain are particularly good. Sift the flour into a bowl and dice 100g butter into it. Add the salt. Rub the butter into the flour until it resembles breadcrumbs. Stir in 1-3 tbsp cold water until the dough seems to want to cling together. Knead lightly to make a ball, dusting with flour if it seems wet. Chill for 30 minutes. Generously butter a 24cm-diameter flan tin with a removable base and dust with flour. This makes the tin non-stick. Roll out the pastry, line the tin, and trim the edges. Cover with foil and half-fill with dried beans. Bake for 10 minutes, remove the foil, and bake for 5 minutes more. Meanwhile, beat together 100g butter and 100g sugar until light and fluffy. Beat in one egg at a time. Fold in the almonds and lemon zest and tip into the pastry case. Halve and peel the apples, carefully cutting out the cores. Place flat side down and slice thinly across the width. 'Plant' the apples in the tart and spread out the slices slightly. Melt a knob of butter, paint the apple halves with it and dredge with caster sugar. Bake for 40-45 minutes, until the frangipane is puffy and golden and the apples just cooked. Paint the apples with the apricot jam, and leave in the warm, switched-off oven, with the door ajar, for 15 minutes. Serve warm or cold. Choose a botrytised dessert wine with a hint of almonds from oaked, sweet Sémillon.